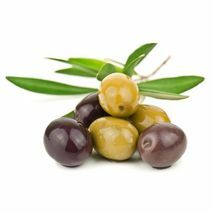 Olives grow in many parts of the world – with Spain being the largest producer of olives worldwide. The great variety in which olives are offered – loose, in jars, stuffed, or marinated in herbs, and with or without stones, has made olives a must have for any creative kitchen. Olives taste absolutely wonderful as an ingredient in Mediterranean dishes, for example as a basic ingredient in freshly prepared bruschetta. That is why we use choice olives to round off our Exquisa Cream Cheese Creation "alla Bruschetta" to create that incomparable fresh and aromatic taste. When shopping for olive oil, you should make sure to buy a "virgin" variety, which means it has not been heated or chemically processed, and all the goodness of the olive is kept intact.